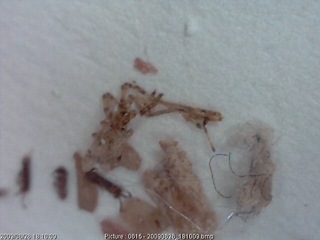 These photos were taken by a follow Morgellons sufferer after undergoing Chemo/Radiation treatment around the date of June 30, 2009. She is a dear person to me and well known in the Morgellons community. Here is a quote from her regarding the posting her photos (which she gave me permission to use in this post). I’m merely going to post them here so they never go away, but trust me, we are coming back to this topic in a later post. 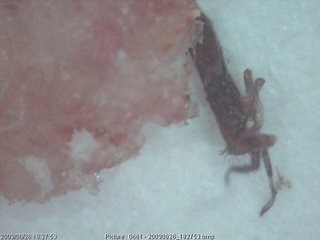 One of the springtails (Collembola) even lived for an hour after coming out of her scalp. Please go have a look, I was so shocked to have so many come out of my hair because I don’t even feel movement there anymore. I also have several lesions on my head after my hair came out. No doubt you can make out the spring tails (Collembola) and what appear to be fungal gnats of some sort. Again, I am only posting these for posterity but trust me, we are coming back to this subject. Our prayers are you dear sufferer …. 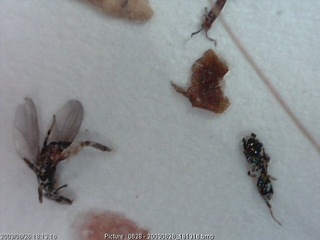 Id’d Collembola, parasitic wasp and fungus gnats, rodnius prolixus are the things that look like ants. If a person is NOT on Chemo, they should look into MSM sulfur. Can take orally & pour & rub powder on skin. It should help a lot. Does Pandora’s box ever stop? You might be very interested in this link. …mosquitoes were infected in Canada by Dr Guilford B. Reed at Queen’s University. They were bred in Belleville, Ontario, and taken down to Punta Gorda and released there. Within a week, the first five cases ever of chronic fatigue syndrome were reported to the local clinic in Punta Gorda. …The Government of Canada had established the Dominion Parasite Laboratory in Belleville, Ontario, where it raised 100 million mosquitoes a month. These were shipped to Queen’s University and certain other facilities to be infected with this crystalline disease agent. The mosquitoes were then let loose in certain communities in the middle of the night, so that the researchers could determine how many people would become ill with chronic fatigue syndrome or fibromyalgia, which was the first disease to show. Are we victims of biological experiments by our own government? I was sent this link 6 years ago. Find a good Darkfield Doctor Clark. I know there are many out there. OOPS wrong link, Google Donald Scott. It would be hard to believe having the fungus gnats, with the wings, coming out of a person’s skin if it didn’t happen to me three nights ago. I was freaked, thought I must have accidentely touch one with the packing tape while bringing it down to my skin. I am both in awe and grossed knowing it’s true by seeing these pictures. But there are countries (Africa’s one) where this sort of horrible thing is an everyday event. This entire piece of writing is mind boggling — and please keep doing what you’re doing. I can’t see us getting anywhere if you let ANYONE run you off. You’re a true saint! Trisha, Just read your post. Fungus gnats have been infecting since june 2009. I also have some good photos. What have you tried to rid yourself? I don’t have this, thought I did at one time but I do not have this stuff. It walked in my door one day after and article came out in the St Pete Times about my patent and it kept coming, coming and coming. Now we are looking at this Nightmare on the Gulf Oil Spill and Lo and Behold they were reporting this when Exxon Valdex dumped pseudomonis pudita in the water up in Alsaka. Look at the lesions on these people in the spill, they are so very familiar. from the Gulf Stream to the Bloodstream. There is a link on this blog to Kendra up there. Now the water in Nuclear down here and it is off my shore. What have we done?????? I can tell you we have allowed the Government to make our choices for us. Sorely, our only saving grace is Alternative and Complimentary Medicine, but guess what?? ?the AMA will have nothing to do with that. Mr Common Sense has a good protocol. So does Pamela Mae and Dr B at Logos Nutritionals. Has anyone else out there been infected by fungus gnats? yes, last week we had an infestation all at once. Several days later I noticed itching all over my body especially in my ears and scalp. I took some cream colored painters tape and everytime I felt an itch- I would first stick it with tape. After several time of doing this I took a 10X mag glass(all that I had) and there they were!! These were the very small ones that I had seen on the walls- smaller than this period . 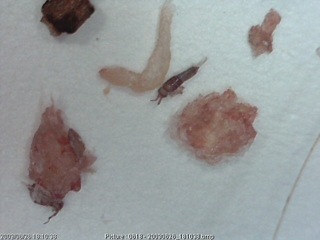 Also found some with tiny clear maggot like bodies with black heads. Also found some small brown flecks that looked like bug parts and even things that looked like antenna or little bug legs. This is freaking me out. We have similar mold issues here in San antonio. My son,wife and i have been sick . Yes– I am in San Marcos and have this problem, too! We also had a water leak under the house that was not discovered for 4 months as it was underground. Fungus gnats have been id’d and while I am battling them with small successes on and in my body, I don’t know how to get them out of my house and car. Vinegar as been one of the best things I have found. it is evident after bathing with either borax or enzymes. You can see them on the water if you look closely. Both help relieve the itching and crawling but they are in my furniture pillows all types of clothing. so they come right back. I think they burrow into the skin, hatch and then fly into environment. They live in eyes nose mouth and sometimes get into ears. I do not have the fibers, as far as I know. I seem to have all of those symptoms but I also have one I rarely hear anyone else say I hear a high pitched sqeaking in my ears sounds like a mouse but it’s one of these things yuck. I tried soaking in epsom salt sulfur 8 shampoo boric aciding everything OMG!!!! Nothing is working. My next step is cayenne pepper cleanse, more eposom salt soaking, an eat right! Okay and another thing my hair moves I guess from the fungus part. Anyone notice more people are bleaching their skin lately (chemical peel’s). This is why britney shaved her head and micheal jackson turned white got addicted to pain killers. I feel sorry for the millions in denial making an excuses for their obvious infection with this crap. I just read the first known account of these babies was in the book of job. I am definitely not a bible thumper but I’m bout to take a look just to satisfy my curiosity! That would be nuts. Yes, I’ve been infected by either gnats or fruitflies. I had worm bins in which I was home-composting. For those not familiar with worm bins, they are entire ecosystem with many de-composers (some of which are springtails and mites). The bins developed a fruit fly problem—then I saw gnats and drain flies (also, the worms weren’t eating some avocado I put in the bins, which is unusual). When I examined the avocado, there were little white pulpa nesting it in that I’d never seen in a bin). I got rid of the worm bins. Woke up one morning sometime after that with bites on my ankle that I couldn’t explain. No bedbugs apparent. 3 weeks later the bites which itched like mad finally went away and that is when I exploded with itching and biting everywhere. They went into my ear (giving me an earache and swollen gland), all over my face and head and privates. I felt them systemically. This went on for a week and a half or so. Now I still itch some, but not like before. Don’t know what this is. Maybe all those epsom salt baths and bathing with tea tree oil helped. This is all very interesting,when I was fist infected,I developed what seemed to be a bad case of dandruff,my folks took a close look because I never had such a problem in all my life, my folk’s told me the dandruff was very small worm’s, this was 7 months after infection. 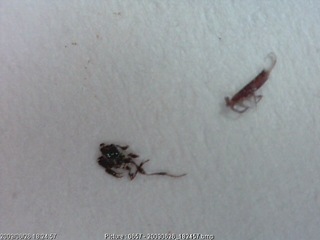 I really had no clue, but I took a closer look, and sure enough I notice a tiny worm attached to almost every hair shaft, but I couldn’t got them out,so I had my hair shaved, these tiny worm’s had what looked like a tony black dot as maybe a head, almost S or thin shrimp shaped with a set of 6 hair like like legs.I never associated this with anything, thought it was unique till I started to notice photo’s such as this, over time now and then I would have a clear colored molting come out from my eye,this happened only twice,one time after taking Ivermectin I found what looked like a larger dead worm in my bedding that look the same as I described above but 1/2 inc.in length or smaller, I took this to the Dermatologist is was seeing at the time,I got very upset when he said oh! it’s just a worm and tossed it in the trash,I could not believe what just happened, proof of what was attacking my body,and this guy totally dismissed it as a simple common worm,this guy was arrogant beyond belief,I got upset to the point when I had left his office he was quite shaken by my response, and was of need to relieve himself in the nearest bathroom,I am normally docile in my nature,but this accrued after getting the run around from 15 different Doctor’s in 2 year’s, so I find this blog very interesting. B.J. There is going to be an accounting by God someday for bioweapon experimentation on people. I’m not sure what ever this is,..but if that’s the case J.B., I surly hope so. B.J. 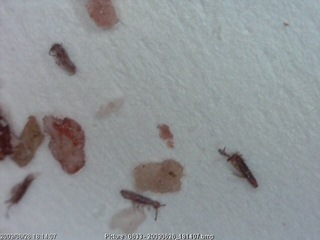 i have had all of the insects listed in this post.i have coughed up ants and had many different worms including round worms in the skin. it is almost too much to bear.I am glad i have faith in God! I use alot of ivermetin and neem. It is disturbing and unbelievable to me that Randy Wymore hasn’t seen any insects or fungus. May God heal you all. elizabeth – i believe dr wymore is using the grant money to find a “cure”. he is a professor of pharmacology after all. cliff carnacorn on a very meager budget as come up with more results than dr wymore. i also think the delay from the cdc is for the same reason – oh it is this but don’t panic – BIG PHARMA has a cure for you all. now take this shot and everything will be all right – NOT!! I am glad I found this site!!! I don’t know what’s going on inside my body—but there is something living in there!!! It could be springtails, it could be bird mites or scabies—-I’m not sure. I don’t have anyone to believe me because I don’t have the usual all-over bites from the bugs that most people do. But a few weeks ago, laying in bed before going to sleep, I felt something bite me inside my vaginal area, up towards the cervix a little. And about 5 days later, i noticed at nite, “movement” down in the private area just under the skin. It felt like a few worms moving around,like they were trying to get out. But I have not had any bugs coming out of my skin. I’m scared that they are incubating down there. I have read some stories of women who felt bugs biting them in the vaginal area, so I know this is possible. I have tried 3 straight days of ivermectin to kill them, and I still feel the movement down there. I want to get rid of these things—I don’t know what they are doing to my insides—that’s the scary part!!! Is anybody that’s going thru this scared like me? Any advise at this point would be greatly appreciated. My email is—–chevycars60@yahoo.com. “It felt like a few worms moving around,like they were trying to get out. But I have not had any bugs coming out’ I too get this feeling it seems to coincide with the full moon. i got this in 2006 and thought i was well or went into remission for a year or so and then it hit me again. Symptoms have lightened somewhat but I still get that horrible dirty itcgy movement in the vaginal/labia area that wakes me up at night and it does feel like something trying to get out. I suspect it is fungal. See recent posts in ‘What is working for you on dealing with chitin – making chitinase. also since learning I have it it comes to me as I sit and ponder who knew they had this nasty crap an didn’t worn others! My ex one now that we’ve broke up I know why he used to offer me coffee which tea is better, boric acid everything , and run me baths that I’d swear he’d put boric acid into mistakenly (at the time) then I’d see lil gnats in my water thinking they came from somewhere else. Also an aunt who uses boric acid no roaches an years touched on the subject years ago never naming it, and has this thing where she doesn’t want people coming to her house. When I called my ex to sort of warn him he sounded not surprised at all and told me he didn’t think I was crazy. I’m telling anyone who will listen this thing is everywhere! This is about to sound crazy but I hear the same thumping the fungus causes in tree’s, wood period. It’s in my phone, computer, eye EVERYWHERE! My seller when telling people is just look in their eye their right there for you to see. And I remind them how do you all of a sudden have allergies when you never did before? Or does it feel like things crawling under your skin because it is. it seems to be most prevalent in countries where we have a lot of GMO foods. i beleive from agro run off from farms and golf courses (they use GMO neamtodes now) it has got into municipal water supplies. i looke forward to when we get onto a private well being dug soon. i know we are told by supporters to forget the source and just build our terrains but this scurge haunts me. Simply to annonce you that there are also cases (still veri rare) of case in Europe. My wife was contamined in 2003. And me that made hardly a month ! Chemtrails ? extraterrestres ? A thing is certain : it is a very heavy ” business”. Going through the same thing and I’m scared to death. Has anyone gotten a full ultrasound or a full body Catscan to find these things so they can be surgically removed???!!! I have been going thru this for 2 months now too. The biting, itching and crawling sensation are relentless. Thought it was scabies because another child in my daughter’s class was diagnosed. I have been doing natural treatments for scabies with a mixture of grapeseed oil, neem oil, orange oil, clove oil and tea tree oil all mixed together. I first use hand sanitizer, then the oil mix and last top with coconut oil. Leave on overnight and then wash with sulfur soap. Washing my hair with neem shampoo too. It seems to make the itching stop while it is on and a little while after. I have washed everything with borax and hot water and a hot dryer everyday now for 2 months. I have treated my 4 girls and husband as well. I am exhausted with it and scared they will get it. As of last week, little clear sand sized granules and brown specks would come off as I would treat with oil. I saved them to take to get tested. 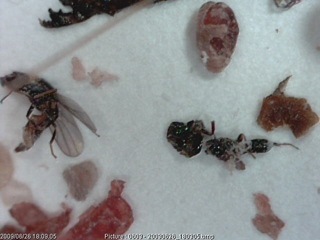 As of last night, I have seen multiple brownish black small pieces and some as long as a rice grain. They are on my skin and clothes. I found these same things by my shower this morning. I am so freaked out and can’t hide it from the kids. I don’t know if I have springtails or Morg. I am afraid docs will think I am crazy. just want my life back. Someone please help as I am crying as I write this. I wear weaves and wigs since I cut my hair. My natural hair comes out at the root super easily sometimes. The tip is white but not your average bulb. Like a coating. Some have a black bulb. This includes facial hair. 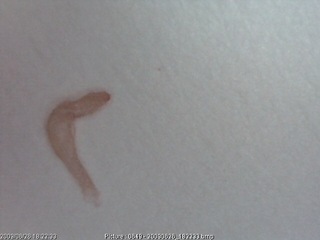 I believe these to be demodex mites which a dermatologist swore it was not. Even today, my hairs have black specks stuck or affixed to them. (I’m a little more freaked out after seeing one of my aunts hairs with the same thing last week. Is it coincidence that we both had dreds, or are related and genetically similar, or have I exposed her to something. She’s diabetic and his heavily medicated and subject to infection due to a disabling car accident.) 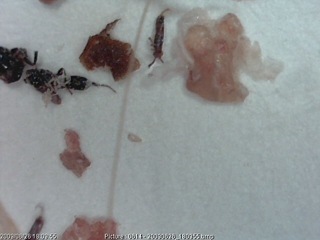 a while back a group of 2 or 3 hairs were all stuck together near the root by a gummy clear substance. But here’s the strangest experience so far. So I get the hair weave fresh out of the package. I comb thru it with my hands and unpackage it. I check the tips and there a tiny black dots on the ends. I am almost certain it was not there when I first opened it. The funny thing is that these black specks or dots look a lot like what was at the root of my hairs. Like they moved to the tips from my roots. So later I took the hair out and washed my own hair. I tied my hair with a clean scarf. I sat in bed on the internet for an hour and ghe scarf slid of from my tossing and moving around. The darn scarf had the black specks standing on the ends of some frayed strands. It freaked me out like a sci fi movie. They didn’t move, but how had they gotten there? ankther weird thing is this black dot on my back. Doctors swear its just a black head but I want to cut it out. My partner saw itaround march when this all began. He said it was a bump with a black thing in it. Since then I have had to instances where I get a small cluster of bumps like a rash except the bumps are black and it feels almost like scabs. Looks like scabs. The rash went upward toward my neck. Both times the rash was near that black dot on my back. So the second time I saw the rash I inspected it better. There were like spikes sticking up. The more I picked with them, the more they seemed to go back into my skin. I oiled my self down as usual and they were gone the next day. The skin was smooth but it was dark where the rash was. I’m sick of doctors saying eczema because those treatments happen to work for this problem. I believe the oil suffocates watever it is. This is all too weird. oh and the gnats. I think they were drain flies. They are now in the new place I’m staying. Strange thing is you would expect to see them jn the bathroom near the drain. I do, but the majority are in my bedroom…I blew my nose and one was in the tissue. I brushed it off months ago. I was half asleep and didn’t believe it came from my nose until the other day I literally saw one fly from my nostril. I never saw it land there to begin with. I would have! This whole thing is a lot. I keep a journal/scrapbook withnevidence taped to the pages of what I’m witnessing. about me: 29 yo african american female, 154lbs, sickle cell trait, allergy/sinus/asthma sufferer, poor vision, numbness in extremities, always cold/anemic?, vericose veins, genital herpes, heavy drinker, depression, light spots on skin, also some mole looking dark spots recently, over prescribed antibiotics as a child. I don’t know what’s relevant but I hope to help someone connect the dots. Just now I heard a gnat humming but did not see one anywhere! I am 45 and have had this problem for 15 years I have all the signs that DCgurrrl has and its frustrating and I think that I have passed it to friends and loved ones when I am around I alway see them scatching and figeting, its the same at work and I am just exhasted trying to deal with it. Concentrating at work is extremely difficult. I hope to find a cure soon.